Could the need to obtain a photo get in the way of Birding? Something happened the other day while birding that prompted me to reflect on how I was applying myself in the field. I was out and about in Queens NY, looking for land birds when I picked up an interesting chip note. It was warbler sounding, almost like a Mourning Warbler. I remained quiet for a few minutes and then heard the chip note of a Common Yellowthroat. Standing quite still, I waited patiently until the Common Yellowthroat came into view. Knowing that was not the bird I heard, I continued to try and peer through the Mugwort brush to see what could be moving around and then took a few steps forward. 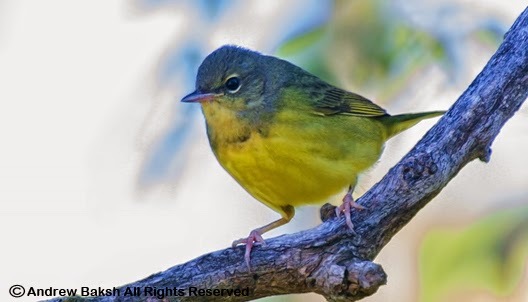 A bird that was not a Common Yellowthroat flew up and perched on a branch very close by and I immediately realized that I was looking at a Mourning Warbler. This was quite a good fall bird. But instead of observing the bird, I automatically reached for my camera and took a few photos before it dropped out of site. I waited to see if it would pop back up but like a typical Mourning Warbler, it was gone along with my opportunity to study it. I looked at the photo on my camera view finder and was satisfied with my initial ID. The bird was definitely a Mourning Warbler, likely a first Winter Bird. While I felt lucky to have at least gotten a "documentation" photo, I felt a bit torn about my actions. Should I have spent more time looking at the bird instead of trying to capture a photo? After some reflection on my actions, I concluded that I did not truly enjoy the moment I had with that bird. If you have read this far, you are possibly thinking, why did I reach for the camera. Well, just a few weeks ago, I tripped the eBird filters for a Mourning Warbler and my description sans photo apparently was not enough. If you are an eBird user, you might empathize with me. It is becoming the norm where photos of uncommon or rare birds, are becoming a "must" in order to have one's checklist approved. This is a tough one and open to debate as I fully recognize the value of accompanying photos for the data in eBird to be of the highest quality. However, there is a drawback if this becomes the standard as the focus could very likely (IMHO) interfere with the art of learning good field observation, taking field notes or take away the joy of just enjoying what is being seen. My MOWA example, is one where I certainly felt pressured by this process to get a photo instead of enjoying the moment. Yeah sure, I was lucky to get a photo to look at and enjoy later but what if I had missed getting the shot. I would have missed both the image and the chance to enjoy "that" moment in the field. It's a bit of a dilemma. The camera has become a valuable part of my getup and I have no plans on changing that but I may reevaluate "when" to get that photo. Of course, when it comes to a rare or uncommon bird more documentation, is always better. So what about you? Do you take a camera while out birding? Do you find it sometimes could get in the way of birding? As we near mid September, shorebirding on the East Pond at Jamaica Bay Wildlife Refuge in Queens, NY has peaked in terms of the diversity of shorebirds, but low numbers suggest we are getting to the point of where shorebird migration has begun to wind down. The cold fronts resulted in more birds departing than arriving. Nevertheless, the last week in August and first week in September, saw very good numbers of Western Sandpipers, White-rumped Sandpipers and Hudsonian Godwits. 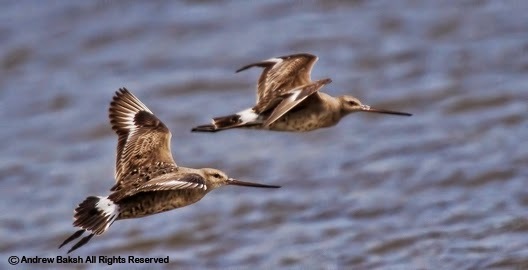 Yes, plural on Godwit (s), is correct. The latter seen in numbers that have not been recorded in many years. To date, I have documented at least 13 Hudsonian Godwits that have dropped in on the East Pond this season, starting with the 6 that Shai Mitra first observed on August 30th on the North End of the Pond. The presence of 2 very tame juvenile Buff-breasted Sandpipers this past week (no longer on the pond) added to the long list of shorebirds that I have seen this year on the East Pond, which now stands at 30 species. You think a healthy pond and lower water levels have helped? Given that I continue to shorebird on the pond into November if possible, we shall see if I manage to add any additional species.